If you're a PC gamer, now would be a good time to prepare your wallet for cheap PC games, as yet another Steam sale has begun. 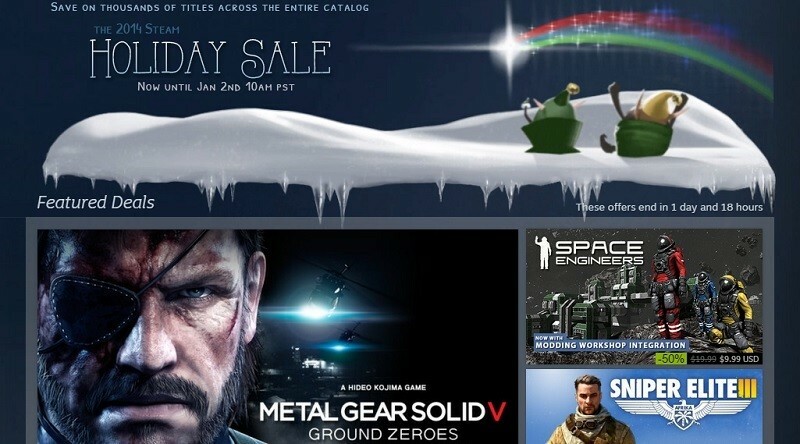 The Steam Holiday Sale, which begun today and offers massive discounts on a range of games, runs until January 2nd. As is the case for most Steam sales, each day comes with a new range of featured deals which expire after two days. There's also a selection of shorter deals on a 12 hour rotation, encouraging you to check Steam multiple times per day to ensure you don't miss out on a sale. Valve has also integrated their trading cards into the sale. You can get one Holiday Trading Card for spending US$10 during the sale, crafting game badges, or voting in the Community's Choice sale. With the latter, three games will be presented for sale, and every 24 hours you can vote on which one should receive a bonus discount. As always, we'd recommend holding off purchasing games that have received a standard discount until the last day of the sale. There's a good chance that the game you're after will appear on a featured deal with a greater discount, so keep checking the Steam store and you'll find some very cheap games over the course of the sale.